Mark Lawrenson was born in 2 June 1957 in Preston, England. He was an elegant and talented central defender who had begun his football career with Preston North End. Despite interest from Liverpool at the time Lawrenson was sold to Brighton & Hove Albion for £112,000 in 1977. Liverpool's reluctance to outbid Brighton proved to be very costly as the Merseysiders had to pay £900,000 for Lawrenson to bring him to Anfield in August 1981. Mark Lawrenson made his Liverpool debut on 29 August 1981 against Wolverhampton Wanderers at Molineux. Goalkeeper Bruce Grobbelaar and Craig Johnson also made their debuts for the Reds in this match. Unfortunately for all three debutantes Wolves won the match 1-0. Despite the disappointing start to his Liverpool career the quality of Lawrenson's performances were such that he made 59 appearances in all competitions in his first season. This set the tone for the majority of his Anfield career as he went on to be an almost ever-present in the Liverpool team until injuries began to to take their toll on his body in the mid-to-late 1980's. Notwithstanding those injuries Mark Lawrenson had a glorious football career with the Merseyside club that was laden with silverware. Mark Lawrenson won the first of five First Division League titles with Liverpool in the 1981/82 season - his first season with the club. In this first season Lawrenson demonstrated his versatility by playing at fullback and in midfield, but it was his central defensive partnership with Scotland's Alan Hansen that stood out. Lawrenson was an intelligent and talented defender with great skill, pace, and he was a an excellent tackler. At the end of the 1981/82 season Mark Lawrenson collected a First Division winners medal as Liverpool topped the league with 87 points, four clear of Ipswich Town. This was added to a League Cup winners medal that he collected in March 1982 when Liverpool beat Tottenham Hotspur 3-1 in the final at Wembley. The victory was courtesy of two goals from fellow Irish international Ronnie Whelan and one goal from Welsh striker Ian Rush. With two winners medals in his pocket Mark Lawrenson had began his Liverpool career as it would continue over a further six glorious seasons at Anfield. During the rest of Mark Lawrenson's career with Liverpool he amassed winners medals for five First Division titles, three League Cup medals, one FA Cup in 1986, and one European Cup in 1984. That is ten major honours in just seven seasons, and remarkably they were won under three different Liverpool managers, Bob Paisley, Joe Fagan, and Kenny Dalglish. Unquestionably the standout season for Mark Lawrenson and Liverpool was 1983/84 when they claimed an amazing treble. In March 1984 Liverpool collected the first element of the treble by beating Everton 1-0 in the League Cup final courtesy of a Graeme Souness goal. Next up was the First Division title as the Anfield outfit beat Southampton into second place. Finally, was a memorable victory in the European Cup final over AS Roma at the Stadio Olimpico. Following a 1-1 stalemate after extra time, the match went to penalties and Liverpool scored four against Roma's two. Lawrenson played in an incredible 66 matches during that momentous season. If the 1983/84 season was memorable for Lawrenson then the next season was also noteworthy - but for all the wrong reasons. Liverpool's Merseyside rivals Everton had run away with the First Division title by a margin of 13 points over the Reds who finished as runners-up. Lawrenson and Liverpool could console themselves because they had reached the European Cup final for the second year running and were ready to defend their title against Italian giants Juventus. The final was being staged in Heysel Stadium in Brussels and European football fans were relishing the meeting of two of the football power houses of the continent. In the Heysel stadium rioting Liverpool fans caused panic and a stampede amongst Juventus fans ensued. In a truly appalling scene 39 fans, mostly Italian, were crushed as barriers and then a wall collapsed under the pressure. Despite the loss of life UEFA officials decided that the match should go ahead. In a bizarre atmosphere the teams played out a lack lustre match which Juventus won 1-0 courtesy of a Michel Platini goal. As it turned out Mark Lawrenson only lasted just two minutes as he had to be substituted due to a shoulder injury. Fellow Irishmen Jim Beglin and Ronnie Whelan also played on that fateful evening. Mark Lawrenson scored 18 goals for Liverpool over the seven seasons he was at Anfield. Lawrenson scored his first goal for Liverpool on 30 September 1981 against Oulu Palloseura from Finland in the European Cup. It couldn't be described as a crucial goal as Liverpool were leading 5-0 at the time and eventually won the match 7-0, at Anfield. His first League goal was far more important as he scored the opening goal in a 0-2 victory over Nottingham Forest in December 1981 at the City Ground. Lawrenson scored his first goal in the FA Cup for Liverpool less than one month later as the Reds dispatched Swansea City 0-4 in a third round tie at Vetch Field. In total, Mark Lawrenson scored four goals in his first season with Liverpool. In his second season he scored seven goals for Liverpool including two against Southampton, one against his former club Bright & Hove Albion and his first goal for Liverpool in the League Cup as the Reds beat Ipswich Town in the second round. With seven goals, 1982/83 was Lawrenson's best season with Liverpool in terms of goals scored. Mark Lawrenson scored his last goal for Liverpool on 22 March 1986 in a 6-0 drubbing of Oxford United in a League match at Anfield. Mark Lawrenson went on to play for Liverpool for three more season, making 126 appearances and winning more silverware. This included Liverpool's first ever League and Cup double in the 1985/86 season. Unfortunately following the Heysel disaster English teams were banned from European competition so Lawrenson had to content himself with just one European Cup success. Injuries were beginning to have an impact on Lawrenson who was still only 31 and eventually a persistent achilles injury put an end to his great football career. "None of the other Liverpool players in the Liverpool side had any idea how badly I was struggling. They were playing so well and winning that their performances masked my weaknesses. When I got back into the team, I found I couldn't turn and run like I used to be able to do. I was just getting by on my positional play and my experience. I found I was a yard slower than everyone else and I couldn't get away with it against top class teams. When Arsenal's Martin Hayes beat me to the ball over 20 yards twice in a minute, I looked at the bench and knew it was time to pack it in." "It came as a complete bombshell to Kenny Dalglish. When the surgeon and I told him, he was speechless. I just couldn't run at all. My Achilles is 2 1/2 times bigger in my right leg now. I suppose, from a certain point of view, I did well to hide my injury from everyone. But even though I was playing on with the injury, it was demoralising and frustrating and, for someone who takes pride in his performance, I was terribly disappointed inwardly." Mark Lawrenson made his debut for Ireland on 24 April 1977 against Poland in a friendly match at Dalymount Park. Johnny Giles was the Irish player / manager at the time and the match ended in a 0-0 draw. Alan Kelly Snr was on the coaching staff at the time with Preston N E and he tipped John Giles off about Lawrenson's eligibility to play for Ireland. The 19 year old had an Irish mother and had been impressing Kelly with his performances at Preston. Ireland employed Lawrenson's versatility and burgeoning talent by playing him at fullback, in midfield, and occasionally in his favoured position at centre half. Mark Lawrenson played his first competitive match on 12 October 1977 against Bulgaria in a 1978 World Cup qualifier. This match also ended 0-0, at Lansdowne Road (now Aviva Stadium). Lawrenson scored his first of his five goals for Ireland against Cyprus in Nicosia on 26 March 1980 in a 1982 World Cup Qualifier. He scored his second goal for Ireland in the next competitive match as Ireland beat Holland 2-1 at Lansdowne Road in the same qualification campaign. This was also notable as it was Eoin Hand's first match as manager of Ireland. In between these two matches Mark Lawrenson renewed his Preston N E acquaintance with Alan Kelly Snr as Kelly managed Ireland in a caretaker capacity for a friendly against Switzerland. Lawrenson scored two goals in Ireland's record victory - an 8-0 thrashing of Malta in a 1984 European Championship qualifier - but the Irish goal that he is best remembered for is one against Scotland. It was Jack Charlton's first qualification campaign as Irish manager and Ireland were playing Scotland in Hampden Park in a 1988 Euro qualifier. A sixth minute goal earned Ireland a precious away victory that went a very long way to helping Ireland to qualify for it's first ever major football championship finals. Unfortunately for Lawrenson injury prevented him from making the Irish Euro 1988 squad for the finals. 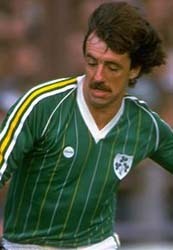 Mark Lawrenson played his last match for the Republic of Ireland against Israel on 10 November 1987. It was a friendly match at Dalymount Park and was also notable because David Kelly scored a hat trick on his international debut.